The Indigenous people of the Plains occupied the southern portion of the three prairie provinces from the woodlands of southeastern Manitoba to the Rocky Mountains. Their environment was distinctive - flat, dry grasslands with cold winters and hot summers. 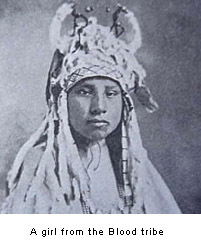 The different groups included the Blackfoot Confederacy or Siksikaitsitapi (Blackfoot, Blood, Peigan and Sarcee) which often battled against the Plains Cree and the Plains Ojibwa known as the Saulteaux. The buffalo was the centre of the Plains culture. It provided the main source of food as well as materials for clothing, housing and implements. The buffalo hunt was a major group activity which required considerable planning. The herds were either captured in corrals or stampeded over jumps - steep cliffs - where they crashed to their death. Head-Smashed-in-Buffalo-Jump, near Fort Macleod, Alberta, is now the site of an excellent museum. The Plains peoples also ate some roots, berries and other animals like elk and deer. The Plains Indigenous peoples lived in tipis made from a pole structure covered with hides sewn together by the women. Flaps at the top controlled smoke from the fire. The dwellings were insulated in winter. The Indigenous peoples of the Plains were nomadic nomadic: people who move from place to place in search of food or fresh grazing lands.. They used a travois to transport their possessions from one site to another. A travois travois: a wheel-less vehicle used for transportation; made of two shafts or poles to which a platform or net was attached to hold cargo. was made by lashing two tipi poles to either side of a dog and attaching a bag behind to carry belongings. Later, horses were used instead of dogs. Families grouped together into small bands headed by a chief. There was also a war chief who handled military campaigns. In summer they gathered in larger groups for the buffalo hunt. Like most Indigenous peoples, the nations of the Plains believed that spiritual powers were everywhere, in objects as well as in living things. Young people sought spirituality by spending long periods fasting fasting: going without food or going without certain kinds of food, especially meat. in solitude. Shamans shaman: a medicine man in North American native culture. Someone with special spiritual gifts and the ability to heal. had special spiritual powers including the power to cure illness. The most important religious event was the Sun Dance (the Cree called it the Thirst Dance). A special circular lodge was built around a central pole and dancers performed for several days, sometimes without food or water, dancing to the rhythm of various prayers. Central to the Sun Dance was the transfer of the "medicine bundle" - a bundle of significant objects (feathers, sacred stones, pipe stems) offered by a virtuous woman from the group.